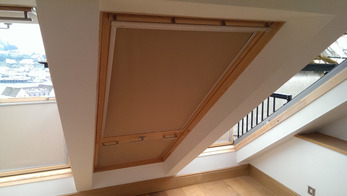 We offer a range of blinds for roof windows including brands such as Velux, Fakro, Rooflite and Dakstra. 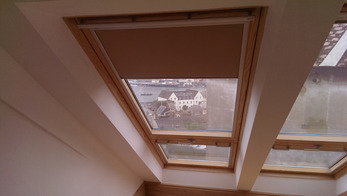 Whether you need light control, heat protection, a sophisticated look or a splash of colour, you are sure to find the right blind for your needs. Simply choose from our wide range of blinds and select a colour or pattern that compliments your room. Options include manual, solar or electric powered operation. You can even operate them via an app on your smartphone with Somfy Connexoon or Tahoma smart home systems. 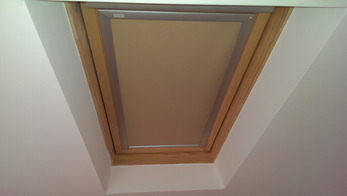 Roof windows bring warmth and light into your home. Controlling these elements with the help of blinds and shutters is key to acheiving an ideal indoor climate. 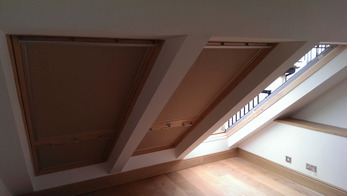 Blinds provide extra insulation, daylight control and heat protection. In this way they can reduce your home's energy consumption by minimising heat loss during the winter and heat gain on a hot sunny day.